This review first appeared in the June 27, 1998 edition of the American Reporter. For just about forever, Sly Dunbar and Robbie Shakespeare have been the hottest percussion/production team in reggae. And, at least since the death of Bob Marley, the duo has been the most progressive of reggae's major figures  constantly bringing in new influences and keeping the music from degenerating into a stale museum piece. To that end (and consistent with much of their earlier work as leaders), their new release  "Friends"  is a funky amalgam of accessible pop laid atop a loose reggae groove. While reggae purists may shun "Friends" as a sell-out, anyone open to new sounds is likely to dig their refusal to be limited by artificial boundaries. And so on this album, we have covers of Cole Porter's jazz standard "You'd Be So Nice to Come Home To," the Rolling Stones' rocker "Satisfaction," Lionel Richie's ballad "Penny Lover" and the theme from "Mission Impossible." Elsewhere, Dunbar (drums) and Shakespeare (bass) have equally top-notch if not as unexpected guests on vocals: One Plus One, Liba, Maxi Priest, Ambilique. The combo of singers and songs creates a neat cross-section of R&B and reggae. "Seems to Me I'm Losing" with Ali Campbell on vocals, for instance, is equal parts Studio One and Motown, as much Isley Brothers as Peter Tosh. Outside of Black Uhuru, it's hard to think of any reggae combo that does as seamless a job of melding American and Jamaican influences. 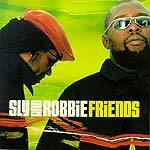 That's the thing with Sly and Robbie, though: They like to have fun.